Need to add documentation to one of your Divi websites? Documentation allows you to provide all kinds of helpful information to your readers and customers. But because documentation is its own content type, you probably don’t want to intermingle documentation content with regular WordPress posts or pages. So to show you how to add documentation to WordPress (and, more specifically, to a WordPress install running the Divi WordPress theme), I’m going to give you a quick tutorial on how to use a new free plugin called DocuPress. What is DocuPress And What Does It Do? DocuPress is a free tool for adding documentation to any WordPress site. It’s developed by Robert DeVore and was born from Robert’s need for a lightweight documentation tool for some of his other WordPress development projects. 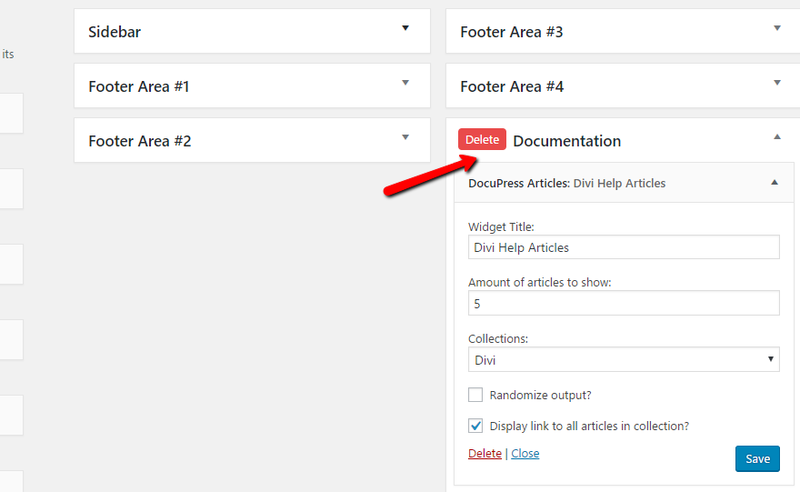 While there are plenty of heavy-duty knowledge base solutions for WordPress, DocuPress is helpful if you’re just looking to add some basic documentation to your site. That is, if you don’t need heaps of shortcodes and built-in analytics. Adds a new Collections custom taxonomy to divide your documentation into different categories. Gives you a widget to allow you to easily display documentation items in your sidebar or in the content you build with the Divi Builder (or other tools that let you display widgets inside your posts). In the future, Robert has plans to add some basic shortcodes to give you even more flexibility. If you want to see DocuPress in action, you can check out a real-world example at the documentation for Robert’s WP Dispensary plugin. We should stress that this plugin is brand new. While it’s not doing anything especially complex, you should still always keep that mind before going all in right away. Now that you know what it does, here’s how you can actually use DocuPress to create documentation for your own WordPress site. DocuPress is available for free at the WordPress.org plugin repository, so you can install it directly from your WordPress dashboard. Once it’s installed, there’s nothing you need to configure. Remember – this is a lightweight solution! Once you activate DocuPress, you should see a new Documentation custom post type. But before you start adding documentation articles, you should add some collections to categorize your articles. Add as many collections as you think you need to adequately divide up your documentation articles. Once you have your collections, head to Documentation → Add New to add actual documentation articles. This is pretty much the normal WordPress Editor except with one key addition. Give your article a title and enter the post content. 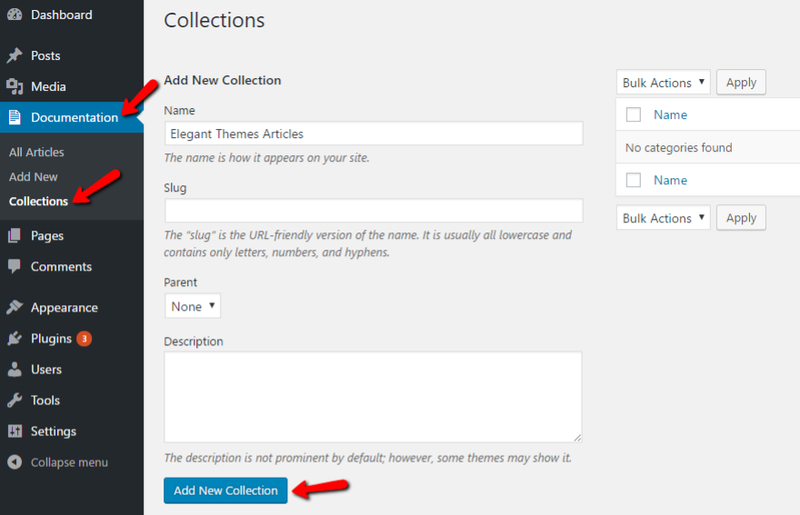 Then, select your Collection like you would a category for a normal WordPress post. Then, make sure to Publish your article. Repeat the process for as many documentation articles as you need. If you’d like to show your documentation listings in your content instead of your sidebar, you can use Divi’s Sidebar Module instead. If you want to display different sections, you can add multiple DocuPress widgets to this sidebar. And you can, of course, add other Divi modules as needed to spice up your documentation page. But that’s all you need to do to add the core documentation functionality. If you need to add your documentation to a page without the Divi Builder, you can also use a plugin like Widget Shortcode to be able to pull in the DocuPress widget via a shortcode. All in all, DocuPress is a pretty simple solution for creating and managing documentation in WordPress. Don’t expect tons of bells and whistles, but if you just want something simple and lightweight, it’s a good option. And while it probably wouldn’t take you too long to create something similar for yourself with custom post types, this way you don’t need to get your hands dirty. Like I mentioned, Robert does have plans to add some built-in shortcodes, so the plugin should soon become even easier to use. Now over to you – what do you think about using something lightweight like DocuPress for your or your client’s documentation? Do you prefer this approach to some of the more heavy-duty documentation plugins out there? The post How to Easily Add (and Organize) Documentation on Your Divi Website appeared first on Elegant Themes Blog.